It’s a Friday in early October, and that means the annual pilgrimage to the One Man Meet, hosted for the second year in a row at Tissington Hall, Ashbourne, Derbyshire. The iconic countryside with Dales and Valleys coupled with stone walled fields and picture book pretty villages appeal to hopper pilots who love to bob in and out of the valleys. The weather at this time of year should be pants and surprisingly the OMM celebrates 29 years of flying on over 31 occasions. To say it was marginal this year is an understatement and yet four slots were flown, but for me the marginal weather gave me a chance to have another random moment at a place of extreme interest that I could relate to all you lovely people who visit the Old and Rusty side of the Easy Balloon’s Website. 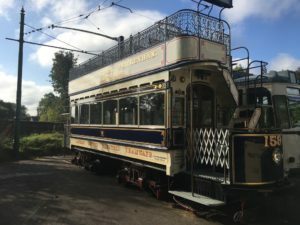 Last year I stumbled upon a place that I had heard about, and never visited but knew all about and didn’t have the time to visit, so as a back up plan, my number one choice was to go to Crich and the National Tram Museum. Discussing it the night before over dinner with Tim Ward, John Hilditch, Lestyn Leek we decided that we would all go and blow me down we only found Melanie and Andrew Davidson already there! Set in the remains of an old quarry, this timepiece started in 1960 around the time of the demise of the famous Tram. Set in a site that ekes out the maximum in a limited landscape, there has been a clearly thought out process in where to spend the resources and how to maximise the potential for tourism. Some lottery money has been utilised to make the most of the opportunities with some fantastic buildings that allow the public to see active workshops and displays of the history of trams through the years, the centre point of the whole attraction remains the 60 odd trams that have been accumulated over the years. Passionate volunteers are happy to discuss their merits and are very well informed with factual information. 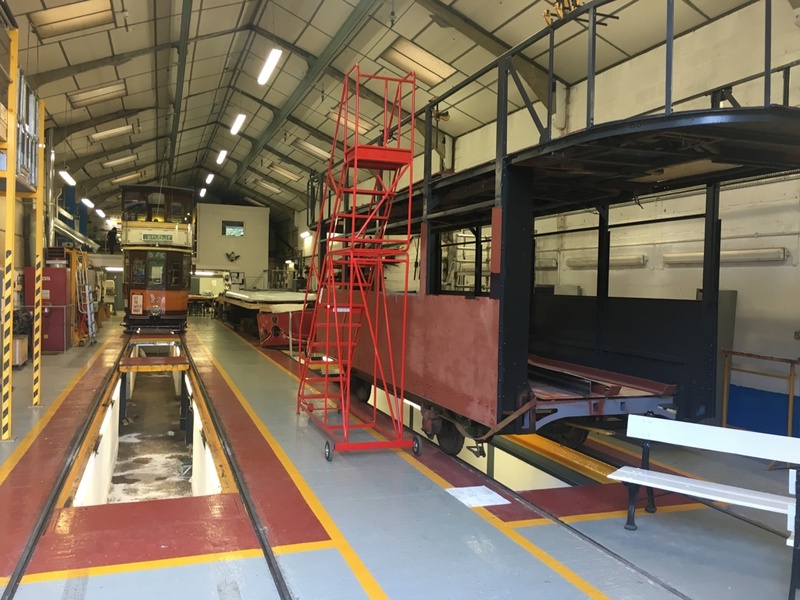 The Trams are still being found with one recently surfacing, but as you survey the vast sheds that house the collection, you realise that certain areas gave more of the exhibits with hot spots such as Glasgow, Southampton, Leeds, Chesterfield and Sheffield amongst the metropolitan centres who used to manage and operate these lovely beasts. One particular example, Chesterfield 7, was particularly amazing in its history. This double decker tram was at one time split into two and used as a holiday home before being rescued and painstakingly restored to its former glory. 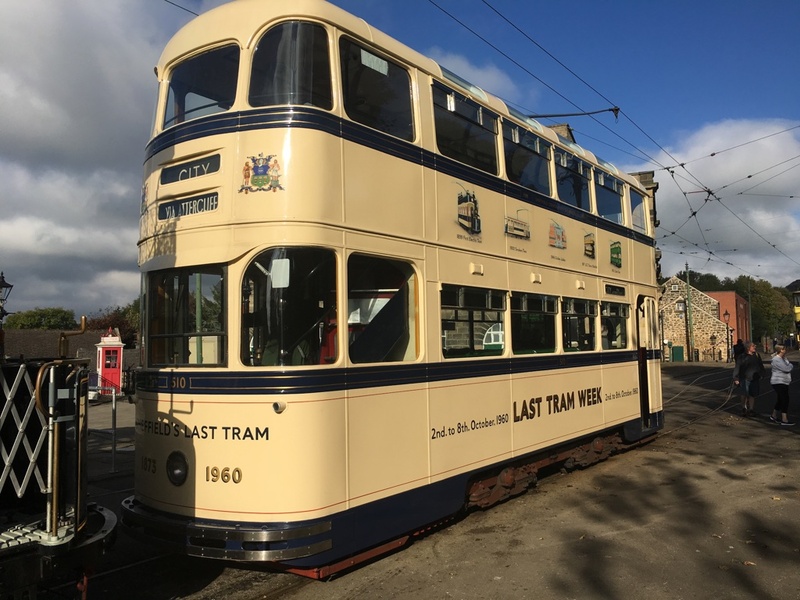 Old fashioned sign writing adorns her flanks and coupled with bright vibrant colours marks her heritage as a work of art that typically costs around £300,000 to restore. Not bad for something that is then valued around the half million pound mark. This is a village environment with the lines running through the middle over a mile in distance. At any one time there were six or seven trams providing services all day and using your old penny (collected at the kiosk when arriving), you get from a guard a ticket to be used as you feel. The surrounding infrastructure is also delightfully modelled in period guise from a traditional pub to an old fashioned sweet shop and a delightful printing press with a machine that was a hundred years plus of age. Staff wore period clothing for the complete effect but that was nothing compared to the visiting Steampunk day enthusiasts who flocked around entertaining the crowds and adding great value to the already good £16 adult entry fee. This fine example used to plow its trade between Richmond and Twickenham in the early 1900’s and proved very popular on the day we visited with its elevated open top vista. 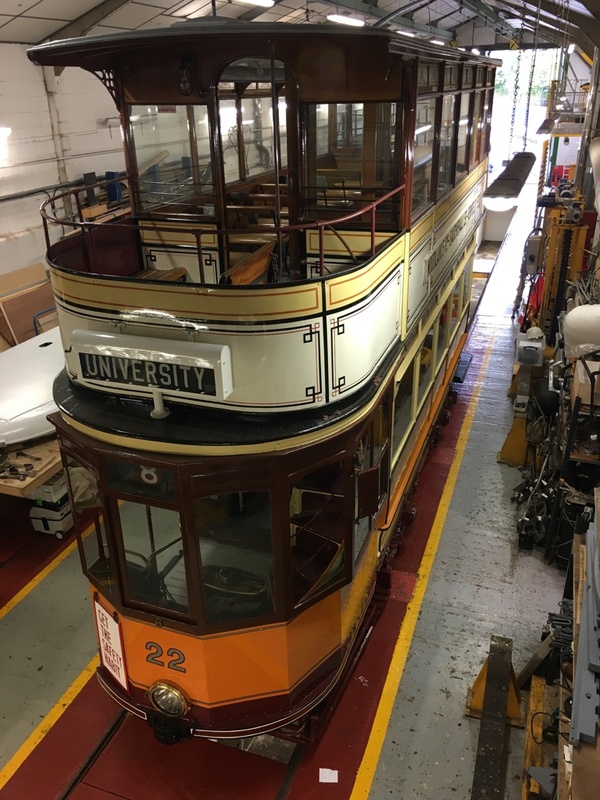 Fortuitously for us, our visit just happened to coincide with a monumental date where one ex-Sheffield Tram was concerned. 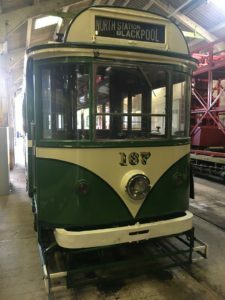 In its previous life, Sheffield 510 had its last working week for the Sheffield City from the second until the eighth of October, some 56 years earlier. To say that Trams are a thing of the past would not be doing justice to the City centres that have now realised the green credentials of these quiet friendly popular modes of transport. 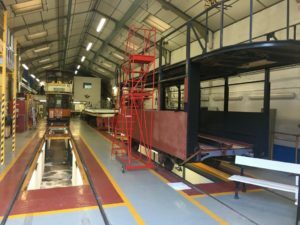 Tram rail schemes with extensions seem all the rage now with lines cropping up all over the country replacing dirty pollution ridden buses every ten minutes, but for me the modern iteration of the breed seems to have lost its soul. I’ll take the older version every time. 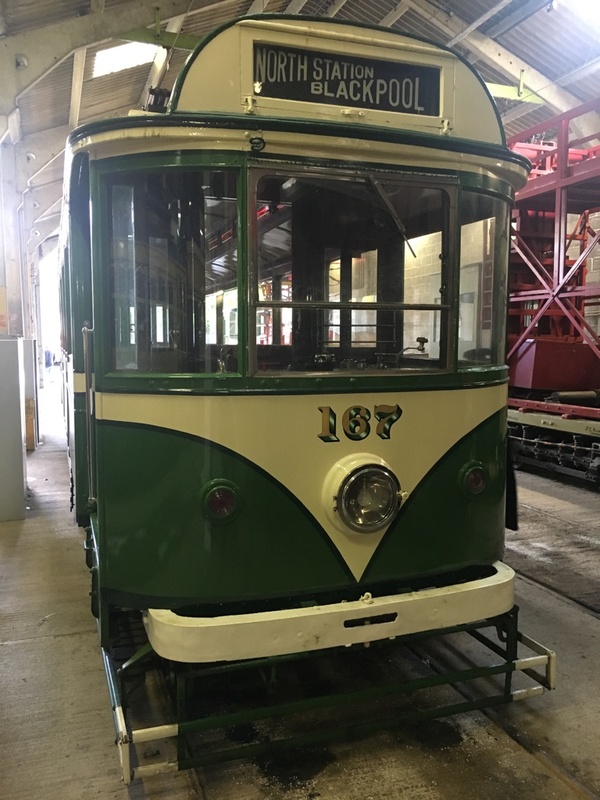 As Blackpool 167 clearly shows that not all Trams need to be double deckers and many happy years she spent taking tourists along the pleasure beach. 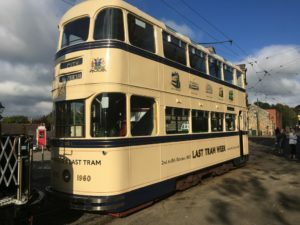 So Next time you find yourself in deepest darkest Matlock, Derbyshire with time on your hands, you could do worse than spend a day reminiscing at the National Tram Museum in Crich. Now if I’m a bit quick I might just catch the last one home …………….